Formulated to meet the trucking industry’s specific needs, ALUMAGLO is a concentrated aluminum brightener, etchant and cleaner with the power to remove even the most stubborn road film, rust, and oxides. Effective and economical, it cleans and brightens aluminum trucks and trailers instantly without heavy buffing or polishing. ALUMAGLO’s tough-acting hydrofluoric acid and phosphoric acid blend is applied directly through low-pressure spray, and leaves vehicle exteriors clean with a brilliant shine. It even makes oxidized aluminum look like new with just one application. If you’d like to learn more about ALUMAGLO, you can download a copy of our latest sell sheet. This new, improved and stronger formula is a blend of two active acids and with a dilution rate up to 25:1 to full strength, depending on surface conditions and temperature. Low-pressure spray ensures ALUMAGLO covers aluminum surfaces evenly in one smooth application, thus keeping cleaning costs down. Fast-acting formula requires just 10-minute contact time to lift rust, oxides, lime and silicate soils and leave a high quality shining surface. 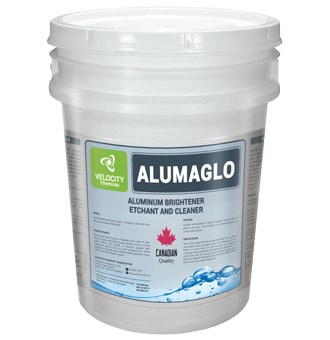 ALUMAGLO is now available directly from Velocity Chemicals, with orders shipped to anywhere in BC within 24 hours. To order, call one of our specialists today at toll-free 1-888-963-9499. Velocity Chemicals will partner with you to ensure you get the right product to suit your needs – precisely, safely and economically.